Is your pet sneezing excessively? 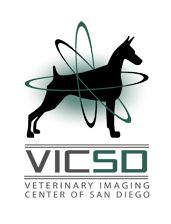 Did your veterinarian recommend that your dog or cat have a nasal scoping or CT? VICSD is the only state-of-the-art diagnostic imaging facility in San Diego that is staffed by board-certified veterinary radiologists and imaging technicians certified by the American Association of Veterinary Radiologists (AAVR). Our expert, compassionate staff ensures that your beloved pet will receive the highest quality of care. VICSD’s advanced equipment and imaging expertise enable our board-certified radiologists to provide the best care for your pet. Unlike other veterinary facilities in San Diego and elsewhere in the U.S., VICSD performs many of its CT procedures under sedation. This means no anesthesia is necessary for the CT scan, which means less risk for the patient. Computed Tomography (also called a CT or CAT scan) of the nasal passages is a noninvasive diagnostic technique that allows for assessment of the architecture of the nasal passages, oral cavity and sinuses. Mass lesions, foreign material, fungal granulomas, turbinate destruction and lesion localization can all be determined with CT. At VICSD, CTs are reviewed by a board-certified radiologist. Rhinoscopy is a diagnostic technique used to directly visualize the nasal passages, localize and visualize the lesion, and biopsy the affected area. Nasal foreign bodies can be removed via rhinoscopy at the time of the procedure, and in some cases flushing of exudated material can improve nasal airflow. At VICSD, rhinoscopy is performed by a board-certified internal medicine specialist. Biopsies are always taken for histopathology so the etiology of the disease can be determined and appropriate next steps can be taken. If you would like to see an example of rhinoscopy, you can click here for a video we made during a rhinoscopy of a 13-year-old feline patient with a history of upper airway noise. Why does my pet need a CT/Rhinoscopy? As with any anesthetic procedure, there is a small risk, as rhinoscopy requires general anesthesia. As a state-of-the-art facility, VICSD performs many of its CT procedures under sedation, which lessens the anesthetic risk. VICSD uses state-of-the-art anesthetic procedures and monitoring equipment to ensure the safety of your pet. The nose has a large blood supply, therefore bleeding following nasal biopsy is to be expected. Some nasal bleeding for 24 hours after the rhinoscopy is normal, and we can counsel you further about care during this period when you bring your pet for the CT/rhinoscopy. Remember that our staff is available to answer any questions that you may have. Please don’t hesitate to contact us with any concerns. Do not feed your pet after 8 p.m. the night before the procedure. Water is allowed. Check with your family veterinarian about medication administration prior to the procedure. Your veterinarian will need to perform a blood panel and chest x-rays to assess your pet prior to anesthesia. Please have your veterinarian submit these x-rays to VICSD through Vetology (www.vetology.net) prior to the procedure, or bring your pet’s x-rays with you to the appointment. Call VICSD to confirm your appointment time and ask any questions that you might have about the procedures to be performed.